TESCO: FREE RM10 Voucher exclusive for Tesco Clubcard members! 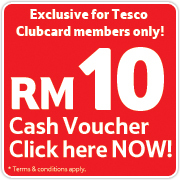 UPDATE: Click here for FREE RM10 voucher exclusive for Tesco Clubcard members, valid till 30 Nov 2011.
exclusive for Tesco Clubcard members! Log on now to www.tesco.com.my and click on the link to download your voucher! Hurry as the voucher is only valid until 28th October 2011! Share this now with your friends and family!